Let's say that an email address was previously marked as bounced with an error message. 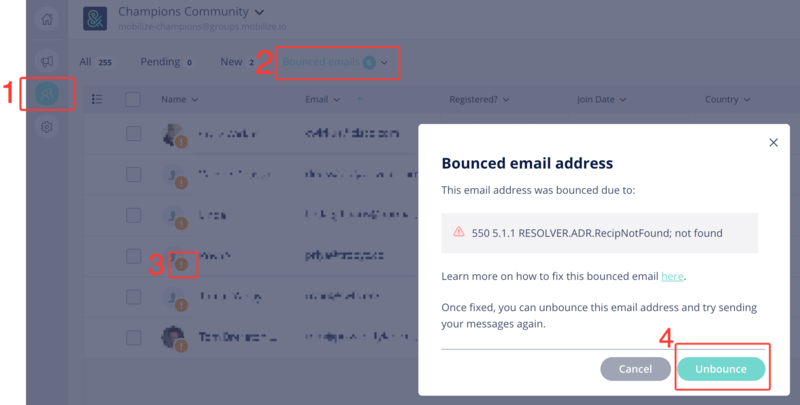 If you're certain that an email address is now valid and that the member can receive emails from Mobilize, you can Unbounce the email and mark it as valid. Hover over the exclamation point, and if you see Bounced email, Learn and fix, click on Learn and fix. Otherwise check this article regarding Deferred emails. Once you know that the email address is working, click the Unbounce button so our system can retry the email. You can also learn more about bounced emails in this article.